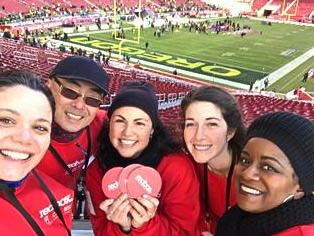 Exhibitors Connection Brand Ambassadors provided event support in a game activation area for the Redbox Bowl featuring Oregon and Michigan State December 31 at Levi's Stadium in Santa Clara, CA. At the 17th annual installment of this college bowl game that launched in 2002, the Exhibitors Connection team provided high-energy event support by handing out branded ear buds to the first 5,000 attendees that entered the activation area and recruiting gamers to play. Using different interactive tactics, the friendly Brand Ambassadors created awareness and visibility for Redbox while helping gamers get started and resolving any issues they encountered. 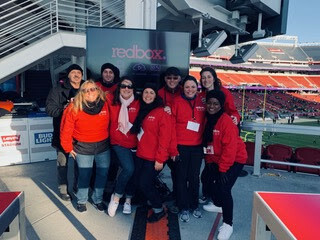 "I enjoyed working with the team you assembled for us in Santa Clara to help with our Activation Event at the Redbox Bowl. Organizing an event of this magnitude can be a daunting task and with this being our inaugural year, it was that much more important that we be prepared for anything the day of the game at Levi's Stadium. Our partnership with Exhibitors Connection was invaluable in preparing us with the best and most qualified staff needed to help us execute a successful event. The Exhibitors Connection team arrived early, were prepared and willing to help with any and all prep work. They were great collaborators, went out of their way to make sure the set up to do list was completed, and were ready to meet and greet fans on time. It would be my pleasure to work with them again." Contact Exhibitors Connection to learn how our exceptional Brand Ambassadors and Product Demonstrators can help you make the most of your 2019 event program.